Dr. Richard Bezozo is Chief Executive Officer of Care Station Medical Group, which he established in 1990 to meet the growing need for integrated primary and urgent care. It has since grown to a premier practice with four locations in Central and Northern New Jersey. Dr. Bezozo serves as Regional Medical Director for major corporations, municipalities, and school districts. He is a recognized speaker on issues ranging from substance abuse and safety in the work place to workers’ compensation cost control. He was a founding member of Urgent Cares of New Jersey, a trade organization that represented Urgent Care centers throughout the state. 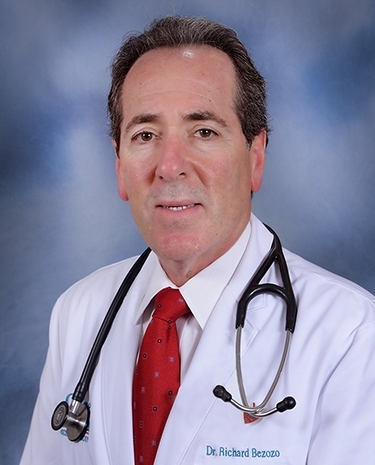 Dr. Bezozo received his under graduate degree from CW Post College, Long Island University in 1979, and received his medical degree at St. Georges University School of Medicine in 1983. He completed two years of surgical residency at Methodist Hospital in Brooklyn, New York and three years of Internal Medicine residency at Muhlenberg Hospital in Plainfield, New Jersey. A: My father was ill when I was young. A: I didn’t choose it, it chose me. During Residency, I moonlighted in a primary care setting. It just seemed right. A: I can talk to people. A: My family and then building a great medical practice. A: To many challenges to name just one. A: Our staff and our patients. They are exceptional. A: We treat everyone special. Boutique care at no additional cost. A: With my family and friends.